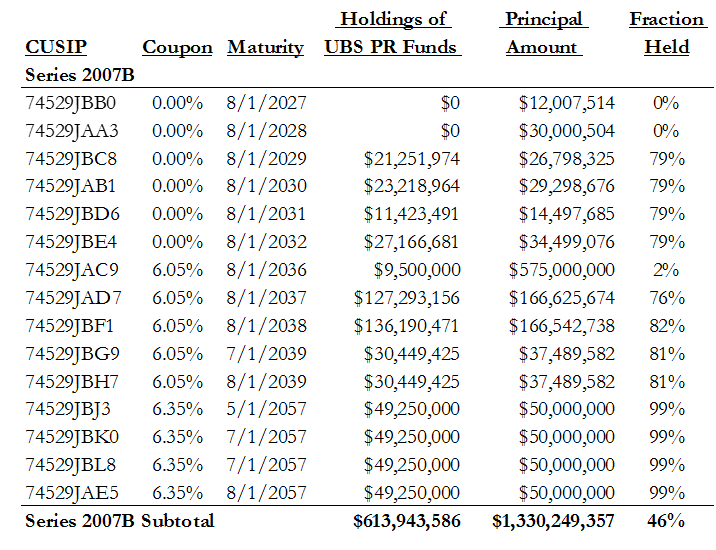 Yesterday we showed that UBS underwrote $1.7 billion of unmarketable ERS bonds and bought them into the UBS PR Funds in 2008, available here. 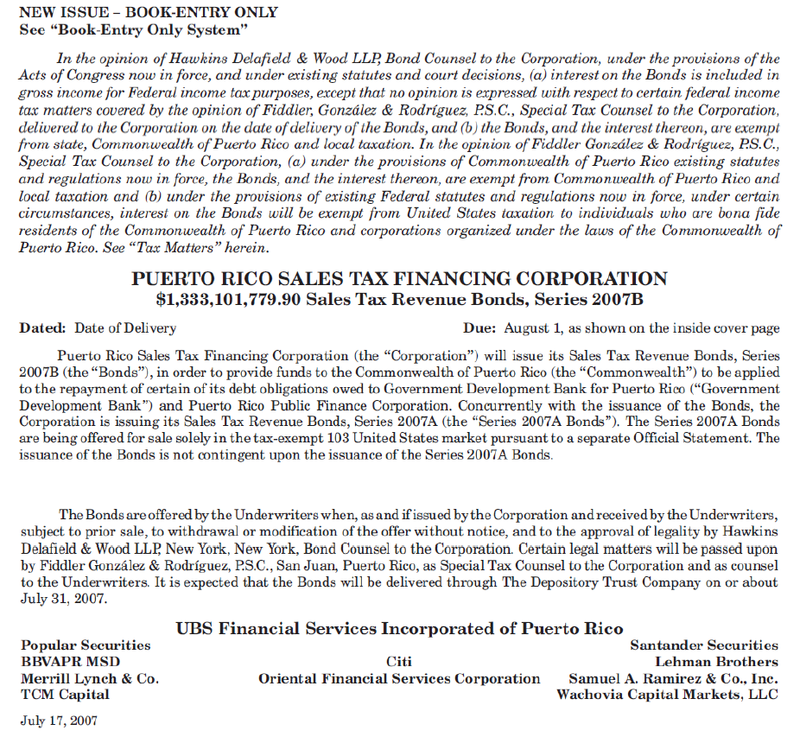 Today, we show similar conflicts led UBS to underwrite unmarketable 2007 and 2008 Puerto Rico Sales Tax Financing Corporation (COFINA) bonds and stuff them into the Funds. COFINA issued two series of bonds in 2007 and one Series in 2008. UBS Investment Bank was 1 of 19 co-underwriters of the $2.7 billion Series A bonds targeting mainland investors. See Figure 1. 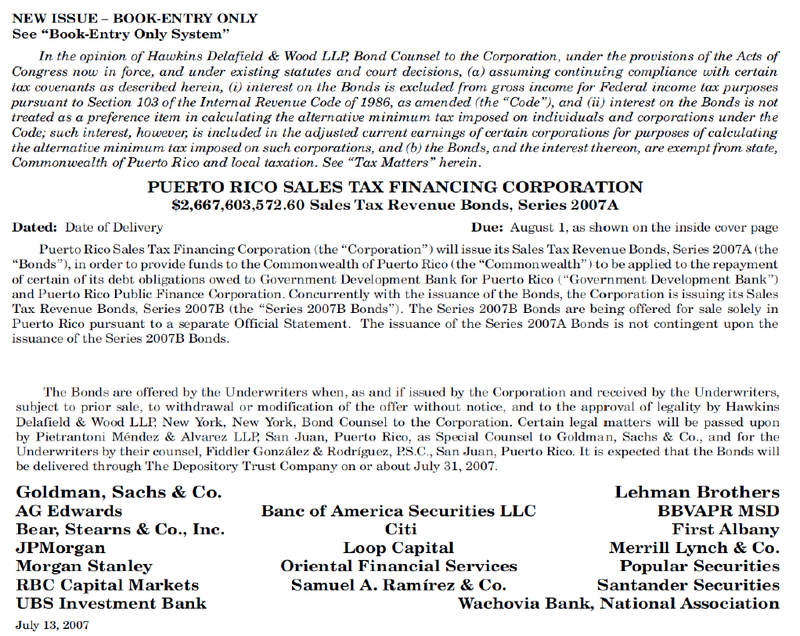 UBS Financial Services of Puerto Rico was the lead underwriter (with 11 co-underwriters) of the $1.33 billion Series B bonds sold only to Puerto Rican investors. See Figure 2. We don’t know how much of the COFINA 2007 Series B bonds UBS committed to sell but we do know UBS purchased $614 million or 46% of the $1.330 billion COFINA 2007 Series B bonds into its proprietary funds. See Figure 3. 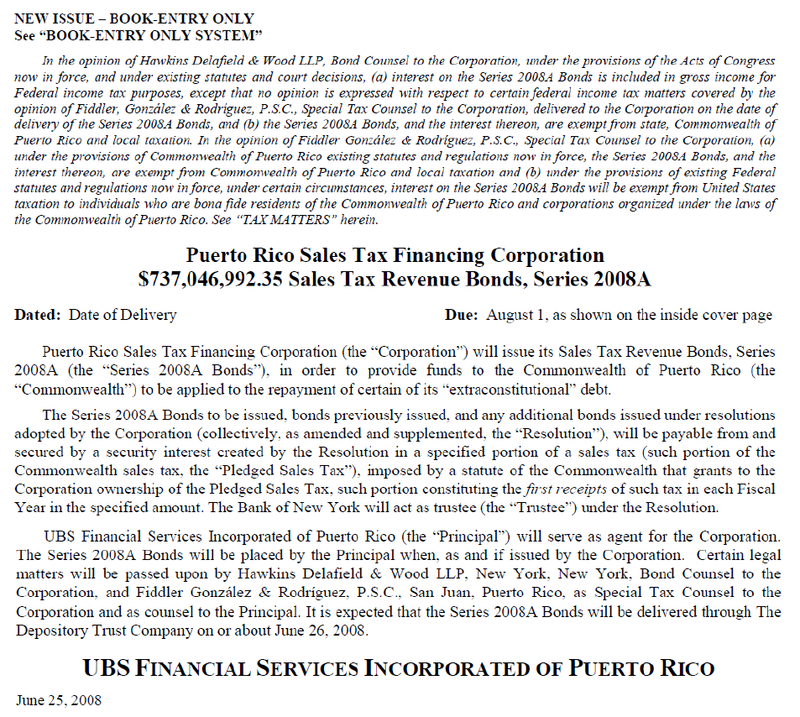 In 2008, UBS Financial Services of Puerto Rico was the sole underwriter of the $737 million Series B bonds sold only to Puerto Rican investors. None of the other 18 underwriters of the 2007 Series A or of the other 11 underwriters of the 2007 Series B COFINA bonds participated in the 2008 Series B COFINA bonds. See Figure 4. 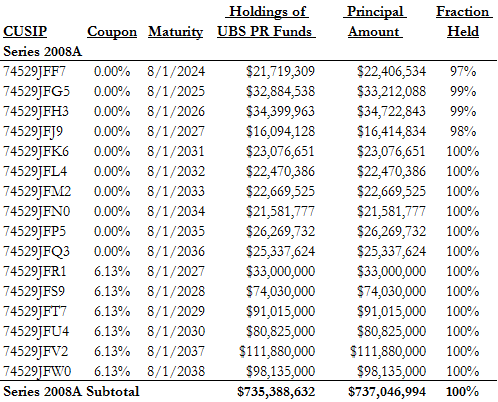 UBS purchased 100% of the $737 million COFINA 2008 Series A bonds into its proprietary funds. See Figure 5. As with the ERS bonds, UBS bought the COFINA bonds it underwrote in 2007 and 2008, making room for these bonds by selling other portfolio holdings. There was no other market for the COFINA 2008 Series A bonds or UBS used its control of its proprietary funds to maximize its fees from underwriting and selling the 2008 COFINA Series A bonds.